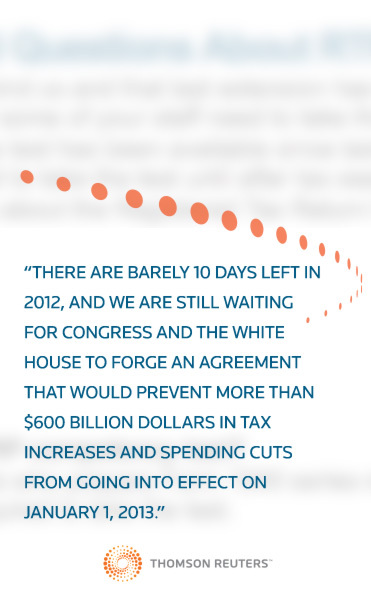 There are barely 10 days left in 2012, and we are still waiting for Congress and the White House to forge an agreement that would prevent more than $600 billion dollars in tax increases and spending cuts from going into effect on January 1, 2013. The House Republicans were originally scheduled to bring their Plan B legislation to the floor of the House for a vote. The bill would have raised the marginal income tax rate on household income in excess of $1 million. The Democrats felt that the $1 million dollar threshold was too high. The bill was unlikely to pass in the Senate in its current state. Allowed the top marginal income tax rate, capital gains rate, and dividend rate to expire after 2012 for taxpayers earning over $1 million per year. The top tax rate on ordinary income would increase to 39.6% for these taxpayers, and the top rate on capital gains and qualified dividends would increase to twenty percent (20%). Kept the estate tax at its current level. The current estate tax structure has a 35% top rate and a $5 million exemption. The exemption is indexed for inflation. Permanently increased the exemption for the individual alternative minimum tax (AMT) and indexed the exemption for inflation. (It is about time that Congress ended the charade of patching the AMT exemption amounts every year or two.) This provision would have been effective for tax years after December 31, 2011; i.e., it would have been retroactive to the beginning of this year. Permanently increased the Section 179 expensing limitation to $250,000 and indexed the limitation for inflation after 2013. The limitation would, however, be reduced if the cost of Section 179 property placed into service during the year exceeded $800,000. Plan B did not include the spending cuts that House Speaker Boehner had offered in his previous negotiations with the White House. In addition, the plan did not reinstate the personal exemption phase-out limitations or the limitations on itemized deductions. The Republican plan was announced when House Speaker Boehner rejected an offer from the President that called for $1.2 trillion in new tax revenue. President Obama's offer included provisions that would have allowed most of the Bush-era tax cuts to expire for taxpayers who earned over $400,000. The President’s offer included about $1.2 trillion in spending cuts. Returns the estate tax to its 2009 structure when the top tax rate was 45% and there was a $3.5 million exemption per spouse. Reinstates the personal exemption phase-out limitations and the limitations on itemized deductions for married taxpayers earning over $250,000 and single filers earning over $200,000. Imposes caps on itemized deductions and major exclusions for upper-income taxpayers effective in 2014. Although Plan B probably would not have passed in the Senate, it did provide a possible starting point for negotiations between the House and Senate that might have resulted in a compromise that would be acceptable to both chambers. President Obama pointed out this week that he has offered a balanced deficit-reduction plan with more than $1 trillion in spending cuts. He feels that the White House’s offer is close enough to the Republican plan that it should be possible for both sides to approve his plan by Christmas. On Thursday, December 20, the Republicans cancelled the vote on their “Plan B” tax plan. The House Speaker indicated that there were not enough votes to pass the Republican bill. Apparently the bill narrowly cleared a procedural hurdle this afternoon and that made passage of the bill look unlikely. The House also recessed abruptly. Based upon reports earlier today, it seems unlikely that a deal will be reached before December 25. Even if an acceptable compromise is reached, any final vote would probably occur after Christmas. While most of the attention regarding the fiscal cliff has focused on the negotiations between Congress and the White House, the IRS is strongly urging Congress to pass the alternative minimum tax patch quickly. The IRS Commissioner said that nearly 100 million taxpayers out of the 150 million taxpayers who are expected to file could be prevented from filing their taxes until March 2013 or thereafter. This number is an increase from the 60 million affected taxpayers that the Commissioner estimated in November. Absent swift congressional action, the Commissioner said that nearly 30 million taxpayers will become subject to the AMT unless the AMT patch issue is resolved soon. The resulting situation could cause lengthy delays in tax refunds and unexpectedly higher tax liabilities for taxpayers who were previously unaware that they would be subject to the AMT. Congress probably does not need to be reminded that there is a large block of registered voters among those 30 million taxpayers. While Congress and the White House search for the sanity clause, we can at least thank Santa for our presents next week. Perhaps some of our elected officials in Washington need to have some spectral visitors stop by during the holiday season, not unlike Ebenezer Scrooge. After enjoying Thanksgiving and a bountiful feast with my family and friends, I wondered how Congress and the White House would approach the issue of the looming fiscal cliff. Thus far, they have lived up to my expectations. It will be interesting to see how their game plays out over the upcoming weeks. Recently, we learned more about two new taxes related to the Health Care and Education Reconciliation Act (HCERA) and the Patient Protection and Affordable Care Act (PPACA). 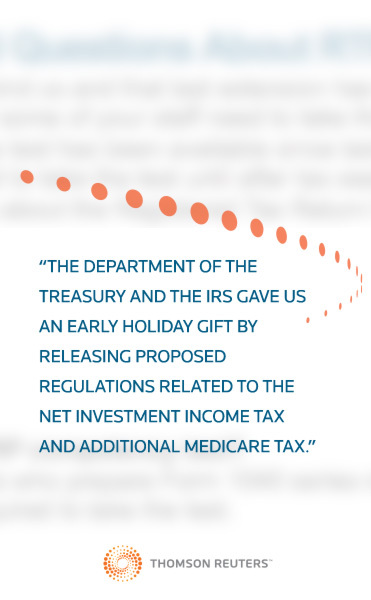 The Department of the Treasury and the IRS gave us an early holiday gift by releasing proposed regulations related to the Net Investment Income Tax and Additional Medicare Tax. Since many tax practitioners are busy in December with year-end tax planning, the release of the proposed regulations is timely. The comment period ends on March 5, 2013, for both sets of rules. The new Net Investment Income Tax (NIIT) goes into effect starting in 2013. The Health Care and Education Reconciliation Act of 2010 added new Section 1411 to the Internal Revenue Code (IRC) and is effective for taxable years beginning after December 31, 2012. The 3.8 percent NIIT applies to individuals, estates, and trusts that have certain investment income above certain statutory threshold amounts. Note: These thresholds are not indexed for inflation. The tax does not apply to any amount of gain from the sale of a personal residence that is excluded from gross income for regular income tax purposes. The IRS indicated that the tax will be reported on and paid with Forms 1040 and 1041. Estates and trusts are subject to the tax if they have (1) undistributed net investment income and (2) adjusted gross income over the dollar amount at which the highest tax bracket for an estate or trust begins in the taxable year. For tax year 2012, this threshold is $11,650. There are special computations rules for certain unique types of trust. In addition, there are some trusts that are not subject to the Net Investment Income tax. Taxpayers who anticipate that they will exceed the thresholds listed above might accelerate net investment income to 2012 or take some gains in 2012 rather than facing the Net Investment Income Tax of 3.8 percent and the possibility of additional taxes if certain Bush-era tax cuts are not extended through 2013. The IRS also released its proposed rules regarding the Additional Medicare Tax. The tax applies to an individual’s wages, Railroad Retirement Tax Act compensation, and self-employment income that exceeds a threshold amount based on the individual's filing status. The rate of Additional Medicare Tax is 0.9 percent. Taxable wages not paid in cash, such as noncash fringe benefits, are subject to the Additional Medicare Tax, if, in combination with other wages, they exceed the individual's applicable threshold. Tips are subject to the tax also. The imputed cost of group-term life insurance coverage in excess of $50,000 is subject to social security and Medicare taxes, and to the extent that, in combination with other wages, it exceeds $200,000, it is also subject to Additional Medicare Tax withholding. An employer is responsible for withholding Additional Medicare Tax from the wages or compensation paid to an employee in excess of $200,000 per calendar year. This is done without regard to the individual's filing status or wages paid by another employer. An individual may owe more than the amount withheld by the employer, depending on the individual's filing status, wages, compensation, and self-employment income. If this is the case, the individual should make estimated tax payments and/or request additional tax withholding using Form W-4, Employee's Withholding Allowance Certificate. Individuals who are liable for the Additional Medicare Tax will calculate the Additional Medicare Tax liability on their individual income tax returns (Form 1040). They will also report the Additional Medicare Tax withheld by their employers on their Form 1040. Note: An individual might have two jobs where his or her wages are below the $200,000 threshold at each job. However, the sum of those wages may exceed the threshold at which Additional Medicare Tax is owed. If any employee anticipates such a situation, he or she can make estimated tax payments and/or request additional income tax withholding using Form W-4. Employers will be relieved to learn that there is no employer match for the Additional Medicare Tax. However, an employer that does not meet its withholding, deposit, reporting, and payment responsibilities for the Additional Medicare Tax may be subject to all applicable penalties. Note: Taxpayers can be subject to the Net Investment Income Tax and Additional Medicare Tax but not on the same type of income. While most of the attention during the past two weeks has been focused on the end of the Bush-era tax cuts and the fiscal cliff, this week's release of proposed regulations for taxes relating to the health care laws reminds us that we already have some concrete tax increases in place for 2013.